In the colonial days three GALLOWAY boys came from Ireland to the colonies. They enlisted in the colonial army and fought in the War for Independence. Marshall, one of the Galloway boys was born 1n 1760 and died December 17, 1827. Marshall Galloway enlisted June 27, 1777 and served as a Private in Captain Brice's Company in the 3rd Maryland Regiment. He was in 7 major battles and a number of other skirmishes. Marshall Galloway was in the Battle of Brandywine near Philadelphia, Pennsylvania that was fought on September 11, 1777. General Sir W Howe attacked Gen. George Washington forces on the Brandywine River. Washington was forced to retreat. The British lost 600 men and Washington lost 1400. Marshall Galloway was in the Battle Germantown, Pennsylvania on October 4, 1777 Again Gen. Sir W Howe was in town when Gen. George Washington attempted a surprise attack against Howe's forces. The British reinforced by Cornwallis took the offensive and the Americans began a strategic retreat. The plan failed but their courage in attacking so soon after Brandywine helped win over the French. Marshall Galloway was in the Battle of Monmouth, New Jersey on June 26, 1778 The battle was between Washington and Clinton with 15,000 men each. Gen. Charles Lee with 6,000 men was to assail the British until Washington arrived. To the astonishment of both Armies, Lee ordered a retreat. Soon after the fighting began. Only the timely arrival of Washington prevented an utter defeat. The Americans rallied and renewed the attack. Though the battle was indecisive the advantage lay with the Colonial forces. Marshall Galloway was in the Battle of Camden, on August 16, 1780. The Americans dispatched an Army to Camden, South Carolina, the Headquarters of the British. Lord Cornwallis collected his scattered troups and joined the battle and they defeated the Americans. British lost 324 and the Americans lost 1,000 and 1,000 were taken prisioner. Marshall Galloway was in the Battle of Cowpens on January 17, 1781 in Spartanburg, South Carolina. British forces under Tarleton were decisively beaten by the America forces under Gen. Morgan. Marshall Galloway was in the Battle of Eutaw Springs a River in South Carolina on September 8, 1781. Colonel forces under Gen. Greene were obliged to retreat, but the main objective of Greene's campaign was accomplished for the British under Gen. Stuart vacated the center of South Carolina and retired to Charleston. The British lost 693 men and Americans lost 408 men. Marshall Galloway was discharged in April of 1783 after serving almost 6 years in the Continenial Army. After the War, Marshall married Hannah WANTLAND 2 Sept 1786 in Baltimore Co. Maryland and soon migrated to Sullivan Co Tennessee. Marshall died December 17 1827 in Sullivan Co Tennessee. Hannah died 1825. She fell from a horse and was killed. James Henderson born 10 Feb 1792 died 18 Oct 1855 Muddy Creek Baptist Cemetery, Sullivan Co. TN, married Sarah BARNES had 12 children , Amanda Melvina (1816-1871) William (1818-1890), Eliza (1820-1898) Jane (1822-1909) James Henderson (1824-1885) Jr., John Marshall (1826-1886),Thomas Jefferson (1828-1911), Sarah (1830-1858), Benjamin Franklin (1833-1912),Mary D. (1835-1912), George Washington (1837-1919), and Nathan Lemmon (1840-1903. All children were born in Sullivan Co. TN. Margaret (Peggy) born 1802 Virginia married John TAYLOR. Susan born 1 married Noah WANTLAND. Marshall Galloway personally appeared in open court, being the Court of Pleas any Quarter Sessions for the County of Sullivan aforesaid, and also being a court of record by status and common law jurisdiction: Marshall Galloway, aged 65 years, resident in Sullivan County in said state: who being duly sworn according to law, duth on oath declare that he served in the Revolutionary War as follows, to wit: He enlisted at the Lower Cross Road in Maryland, about 30 miles from Baltimore under Lt. James Allison, who belonged to Capt. Brices’ Company, Col Gumby of the Third Maryland Regiment which belonged to the Continental Army for and during the month of June 1777,and continued in service until April 1785. H received a discharged at Annapolis in Maryland, was in service between 5 and 7 years in succession. He further states he was in the Battle of Brandywine, Germantown. Monmouth. Gates’ Defeat Before Camden, Cowpens, Guilford, under General Greene, at Camden, at Eutaw Springs, and a great number of skirmishes. Col. Otho Williams commanded the Regiment to which he belonged which was attached to the Brigade of Gen. Smallwood. He remained in the Brigade of Smallwood until he was transferred to the South under Gates. His discharge is lost and he does not know any person by whom he can prove his service in this country now. Joseph Brownley, of Maryland, if alive, could prove part of his service, and William Cole, of Deercreek in Maryland, could prove it if alive. Be it remembered that on this 4th day of February, 1826 personally appeared Marshall Galloway before me, the subscriber Samuel Rhea, one of the acting justices of the peace for Sullivan County, and made oath that the omission to state in his original declaration now on file in the war office the fact that he had not disposed of his property since 18th of March, 1818 was clerical, he having made the full statement to the drawer of his declaration to supply nor has the same since that time been reduced, that he has had of necessity to raise and kill stock on which to subsist, of which it would be impossible for him to keep an enumeration, that his general property has not been changed . And the said Marshall Galloway doth further solemnly swear that he was a resident citizen of the United States on March 18, 1818, and I have not since that time by gift, sale, or in any manner disposed of my property or any part thereof with intent thereby to diminish it as bring myself within the provisions of the Act of Congress entitled An Act to Provide for Certain Persons Engaged in the Land and Naval Service of the United States in the Revolutionary War passed on the 18th day of March, 1818, and that I have not nor has any person in trust for me any properties or securities, contracts, or debts due to me; nor have I any means or income other than what is contained in the schedule hereto annexed and by me subscribed. Inscribed on the roll of East Tennessee at the rate of $8.00 per month to commence on the 4th day of February 1826. William GALLOWAY born ca. 1798 in VA died 1861 in Hempstead Co., AR. married Sophia COX born 1805 in TN daughter of Jessee and Susanne SUMMER COX. Abraham born ca. 1824 in TN died 1881 buried Shover Springs, Arkansas married Sarah Polk in Meigs Co. TN then moved to Arkansas in 1853. No children. Eliza born ca. 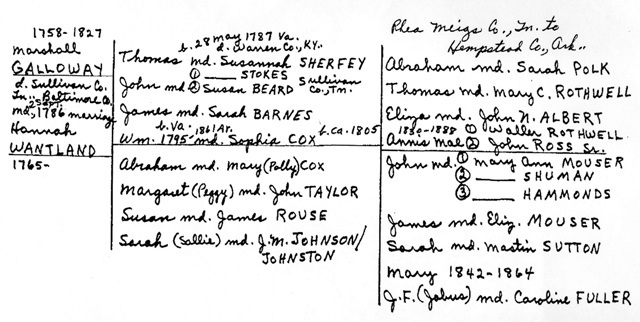 1827 in TN died 1892 buried Hope, AR married John M. ALBERT in Meigs Co., TN One child: Sarah. John born 7 July, 1832 in Rhea Co, Tennessee which was later Meigs Co, TN died 10 April 1902 buried Matt Hall Cemetery Hempstead Co.. married Mary Ann MOUSER Hempstead Co, AR. 1800 Tax list of Botetourt Co. Virginia GALLOWAYS listed: Benjamin, William and Marshall. Marshall had 3 horses. 1827 December 17 death of his father, Marshall GALLOWAY. 1830 census in Rhea County, Tennessee (Later to become Meigs County) William and Sophia had 3 children under 10 years of age. Thomas COX, in the same County, could have been Sophia’s brother. 1832 William GALLOWAY’S name was on the land deed Sullivan Co. with his brothers and sisters. 1836 William GALLOWAY and Thomas COX witnesses. 1837 William and Thomas COX (his brother-in-law?) viewed and marked a road leaving the Big Road at or near Thomas and running by William to intersect the Valley Road at or near William Capises. 1838 William and Sophia had 4 children in school between the ages of 6 and 16. Thomas COX had 1 in school. 1839 Viewed road leading from Capt. GALLOWAY’S. 1840 Census of Meigs Co, Tennessee William GALLOWAY was 40 to 50 years old and Sophia was 30 to 40 years old They had 7 children under 15 years of age. 1840 Thomas COX and William GALLOWAY worked a road from Decatur to Athens. In the 1850 census Thomas is a school teacher, this is the son that left his wife in Arkansas and went on to Texas. 1849 Aaron King estate William owed him $7.75. William bought 1 piece upper for $2.75 (leather? ).